Well. Greg is gone – off for a few months of tech training that will, we hope, qualify him for a job that will have us sticking around here for a few years. Wait, did I say hope? I mean – well – I’m confused. We had better move somewhere fun after this – and by fun, I mean someplace where the leaves change colors, and it might snow once in a while, and you can play outside in the summer during daylight hours, and you don’t have scorpions in your bathroom. That kind of a place. Anyway, my older sister has agreed to come and stay with me while he’s gone, to keep me company. She may (if she so chooses) be featured on the blog at some point. Since she’s here and all. I’ve been very busy since Greg left on Sunday working on a (non-yarny) project and various pressing issues, but I haven’t gotten much done – of the wooly variety at least. And she said, “Ohhhhhhh.” No more giggles from her! Isn’t that color gorgeous? Well, you can’t really see it, but I love it. It’s not so brown, much greener. I may replace that pic later. It’s like…it’s like a forest green heather, one of my all-time favorite of the colors. I love it way more than I love the sage-y seafoam of the other one, and I like that a lot. And, of course, it’s 100% cashmere. What? No! Stop it. Be quiet – what do you want from me, it was two dollars! You think I could just leave it there? I turned my face from the wool, the lambswool and angora blends – even the angora and silk blend! So what if I don’t have the other sweater wound yet – I do have it frogged, just not wound and weighed and washed. I will. It’s not like I’m going to start this one before I finish the other, I just had to get it. It’s a sickness. No, thank you, an intervention is neither welcome nor necessary. No! Don’t even think it. If you try to get between me and that sweater, I can’t be held responsible for my actions. Keep your hands out of my cashmere. I’ve got a seam ripper, and I will cut you. This entry was posted in I Want it Bad. Ohhhh!!! Darkish forest green is my fave too! What on earth thrift store are you shopping at?! Ha ha! I never find sweaters that good! I understand your yearn to live someplace for more than a few years, but then again I also know how much I hate this seasonless weird bug/pest infested place as well. Hang in there while your hub’s away. Is he AF? 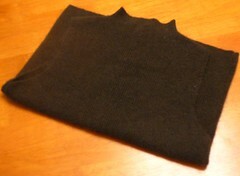 You must be the Cashmere Whisperer; there is no other explanation for how you keep finding cheapo cashmere sweaters! I have never once seen a cashmere sweater in a thrift shop. It’s a tragedy… Congratulations on the forest-green beauty, and I shall not be messing with you and your seam ripper. Yeah, put that cover back on the seam ripper. You are really making me want to start looking for sweaters. When I look at sweaters I already have, I wonder if I could do it. I’m a little nervous, but I guess if I bought something really cheap, I could (maybe) frog!! Oh my gosh, where do you thrift shop?? We have a few thrift shops where I live but they are so over-priced and I don’t enjoy going to Value Village on 50% off day with kids. I’m so jealous. So, I was thinking about where you could move to and you could move to Canada in Alberta in my hometown of Cardston. It’s beautiful, it’s has prairies and the mountains are 45 minutes away. The leaves turn colors. It snows during winter but melts in a few days because of the chinooks. Oh and my bestest friend in the whole world lives there right now. I would like to move back for a little while. I’m in Saskatchewan and it is freezing cold here where there is snow ALL winter until March. The only downside to Cardston is that its a small town. Just a little suggestion. I’m so silly. no. canada is just too… Canadian for us.